It’s a while after Jesus left his followers to practice what he preached on their own. Most of them were gathered up in Jerusalem but the authorities there stoned one of them and arrested others and it forced them to scatter a bit. Peter has been down in Joppa, a sea port town, but he got a strange summons to go back to his home in Caesarea Philippi. It came from a Roman centurion, a lieutenant in the occupying army and it involved traveling with the messengers he sent, Gentiles, something no good Jew of the time would do on his own. Along the way he has a strange, troubling dream. He was hungry when he went to bed and in the dream a huge sheet is let down from heaven full of animals of all kinds. “Slaughter and eat”, he hears a heavenly voice say. It’s a buffet, apparently. Now Peter is a good Jew. He knows the rules for good Jews, the kosher rules. Those rules are ancient and they prescribe that certain animals may not be eaten. Furthermore, even the ones you can eat must be slaughtered in the presence of rabbi according to another set of rules. These animals aren’t kosher and Peter isn’t authorized to do kosher slaughtering, so when God tells him to go ahead and eat, he’s horrified. He’s not falling for that; he tells God in so many words that he’s not that kind of guy, he’s a good guy, a rule abiding guy, and he’s not about to violate those rules now. I love this, don’t you? Imagine telling God off for not being religious. Yeah: I love this part. Peter actually tells God off for not being Godly enough. Now, I’ve had my own arguments with God, and there are a lot of others in the Bible, and one thing I can tell you: no one wins an argument with God. Try it yourself. So the heavenly voice says this: “What God has made clean, you must not call profane.” Peter doesn’t seem to get the point at first, does he ever? do we? So it happens three times. Three times God has to make the point that it’s God that determines what’s Godly, not Peter. Finally he gets it, presumably gets a snack, wakes up, goes on the journey where he meets up with Cornelius. I don’t know that I can say strongly enough how awful this is. It’s just not done: good Jews do not go to the home of a Gentile, especially a Roman, most especially a Roman officer. But there he is and it turns out the summons was because of a heavenly visitation, an angel, who told Cornelius to send for Peter. My guess is that Cornelius wasn’t any happier about the whole thing than Peter; he has his own set of rules and how would it look, inviting a Jewish peasant preacher and friend of a recently crucified guy to his home? But he’s done it and when Peter gets there, he tells them about Jesus, how he preached and healed, how he was crucified, how he rose, how he sent the Holy Spirit and suddenly the whole group there feels that Spirit there, gets filled with it, which I assume means they miraculously know how to sing, “Every time I feel the Spirit, moving in my heart, I will pray,” or “Do Lord” or something and there’s a party and everyone has that camp feeling. I guess they all join hands and sing kumbayah and Peter goes back to Jerusalem to face the music. Because back there, the Christians in the church, all of whom are good Jews, have heard what he’s done and they’re horrified. The text says, “[They] criticized him.” Every pastor knows what this means: it’s when the people in a church start whispering about you and the Deacons get frosty and the chair sends you an email that says “People have been talking about some of your recent decisions and actions and we’re going to have a meeting to discuss this on Thursday night.” You see, Peter has broken the rules, lots of rules. I know what those Jerusalem Christians are thinking. They’re like the woman in the old declining church I served once who said to me “Pastor, I hope you will bring people into our church but I hope they will be our sort of people.” I knew what she meant. She meant people who knew how to sit in pews quietly, read the bulletin, use the hymnal to sing “Our God Our Help in Ages Past”. I’ve been to the meeting Peter’s going to because I remember when people who came into the centuries old Congregational Church crossed themselves and when some were noisy and some were children and some wanted different music. Peter was right when he argued with God: Peter knew the rules. It’s God that doesn’t seem to care about them. The reason is that God has a purpose. Right from creation, God’s been creating a humanity fit to live with. This takes some doing even among us. From our start, God intended to make us fit companions. There have been a couple of false starts but then God starts with Abraham to bless the whole world. This is where God is going: all people are children of God and it’s time to act like it. Not even the rules we think make us Godly are as important as God’s purpose. No one’s getting left behind. The whole story of the church is about breaking the rules that make the walls that keep us apart. What makes people mad about Jesus? He eats with sinners. What makes church people mad about Peter? He eats with Gentiles. The church is still struggling with this Gentile/Jew divisions when Acts is written but it has exploded around the Mediterranean world because on the whole, it decided early on to embrace these Gentiles even though they didn’t know who to use the hymnal or follow the liturgy. What was important?—that they were children of God and had the same gift of the Spirit as the people in the church. In other words, the church people figured out they were just as much children of God as they were. Our whole history witnesses to this rule breaking, this wall breaking. 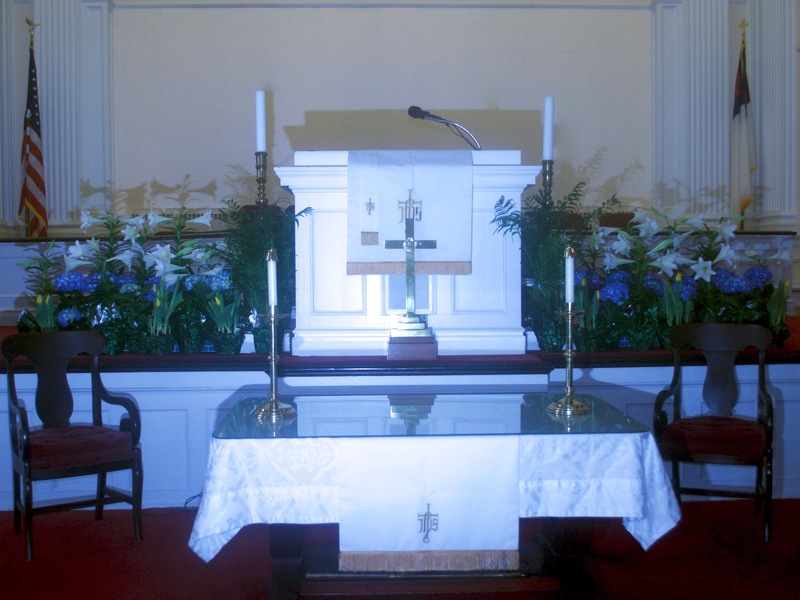 Congregationalists started out literally putting a wall called a fence in front of the communion table to emphasize it was too holy for just anyone; only covenanted members seen to be really good at following rules could come to the table. We got rid of the fence. Congregationalists used to think you had to be male to be a Pastor. In 1854, Antoinette Brown was the first woman ordained as a Congregationalist. More recently, we’ve had a long argument about fully, openly including gay and lesbian folks. When I read about Peter being criticized for eating with Gentiles, I can’t help thinking about the tense meetings I had early on when I preached that God was breaking this wall down. Some of us are there; some churches are a bit behind on this one. But it’s where we’re all going. But that’s not our problem here. No, we’re fine with that one and it’s time for us to ask: what other walls are waiting to be torn down here? What rules are we invisibly upholding that keep people out, keep people from fully feeling the embrace of Jesus? Our purpose statement says we’re about building a diverse community; diversity requires doing what the early Christians did, listening to the Spirit instead of our rulebook. This is indeed a conversion story, but the conversion at its heart isn’t Cornelius; it’s us, or more particularly people a lot like us, church folks. The conversion is this: they stop thinking it’s their church, their rules, their comfort, that’s important and realize the church doesn’t belong to us, it belongs to Jesus; the church isn’t inspired by us, it’s a vessel for the Holy Spirit. And the Spirit goes where it will, not where we’re comfortable. If we listen, if we’re faithful, we will move along to where God is going. Where is that? Why where God was going all along: to the place where there are no walls, no rules, just the love of God and the embrace of Jesus and the fellowship of knowing each other, every single one, as brothers and sisters in the love of God.